The Magic Kingdom is largely made up of typical theme park food establishments that offer burgers, chicken fingers, pizza and the like, but there are a few dishes that I enjoy and a few restaurants I could recommend. For Table Service I like the atmosphere for Be Our Guest, but the meal isn’t the most amazing food. Cindrella’s Royal Table offers a special dining feel with Princess dining. The Crystal Palace offers Winnie the Pooh characters and a full buffet from which everyone in the family can graze. The Diamond Horseshoe is just a total waste of money and time. The Skipper Canteen is very unique for theme park dining with many unusual Asian influenced dishes. Liberty Tree Tavern is known for its traditional, home-style turkey lunch and dinner. The Plaza Restaurant offers a variety of lighter dishes and sandwiches, but the restaurant is very cramped. I avoid Tony’s Town Square as it is the worst imitation of Italian food that I’ve consumed. Be Our Guest breakfast is very over priced, but many clamor to enter the restaurant. Lunch at BoG is mainly just common sandwich dishes. Casey’s Corner is good for a quick hot dog and fries and you can sit at the tables and take in the sights and sounds of Main Street. Columbia Harbor House offers theme park versions of fried fish dishes. Cosmic Ray’s has the fun entertainment of Sonny Eclipse but just your regular hamburgers and chicken fingers. Lunching pad is another hot dog location with frozen drinks. Main Street Bakery serves Starbucks drinks and snacks. At Pecos Bill I prefer the Taco Salad as you can build it as you desire from the generous toppings bar that includes shredded cheese. Pinocchio Village Haus has some good flatbread pizzas and Tortuga Tavern is just slop barbecue. If you want a good barbecue sandwich, head to Flame Tree BBQ in Animal Kingdom. If you want a cinnamon roll, head to Gaston’s Tavern and Aloha Isle offers the famous “Dole Whip.” Sleepy Hollow offers waffle sandwiches and funnel cakes. Tomorrowland Turkey Legs aren’t currently active. How do I go ordering a snack at ‘Be Our Guest’, say the French onion soup? Do I need to make a reservation at the restaurant for lunch? 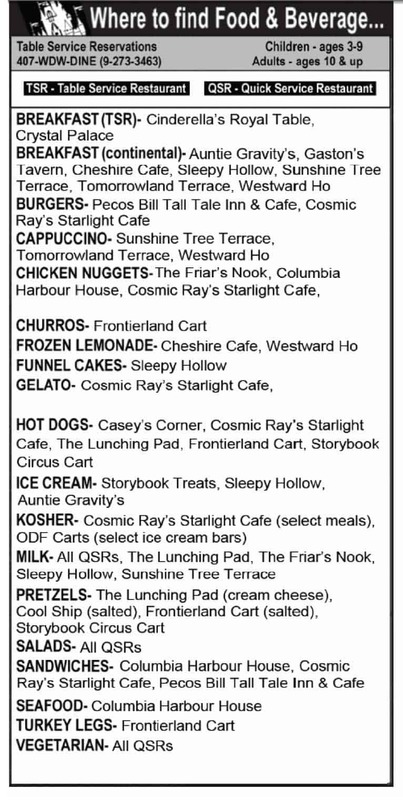 And if so, will they be expecting that I use a Quick Service Credit (from the Disney Dining Plan) when seated? Yes, you’ll need a reservation and no you’re not required to use credits, that’s up to you.